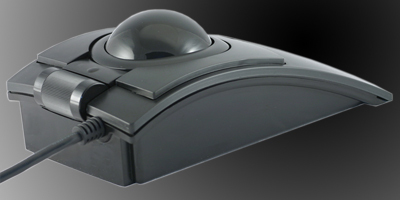 The New L-Track High Performance Trackball from Clearly Superior Technologies "Laser Tracking". Especially well-equipped for multi-screen setups, this enables you to target with single pixel accuracy or move with unprecedented speed. Utilizing the latest in laser navigation technology, the L-Trac has selectable resolutions of up to 1600CPI (400, 800, 1600), which are "button selectable", allowing rapid changes of sensitivity. The high performance laser navigation system is capable of tracking at greater than 30 inches per second, even at a 20G acceleration rate. This means the user can "fly" around the screen with a flick of the finger or snap from one side of the screen to the other with a healthy flick of the arm. Either way, this precision, high performance pointing device produces predictable, quick and precise motion that becomes intuitive in a few minutes of use. The scroll wheel is smooth and readily accessible, located above the center button. Also an option, the L-Trac can be fitted with two external switch jacks allowing the use of 5 buttons for added flexibility. Superior-X Button Control software (included), allows the user to set different button settings depending on the application. This allows control of applictions, such as media players, directly from the trackball (volume control via scroll wheel, etc. ), putting maximum control at your fingertips. Superior-X also allows keystrokes to be recorded and played back with the click of a button, allowing repetitive application tasks to be completed quickly. This performance coupled with the natural contour of the L-TRAC makes these trackballs Clearly Superior for all applications including general computing, gaming and Computer Aided Design (CAD). CAD users love it because you can drag a line one pixel even on today's high resolution displays of 1900X1080. Then, with a button stroke, they can fly around the screen to get general tasks done. Game players have called it an "Almost unfair advantage", citing the fingertip control and precision, high performance tracking. The combination of Superior-X Button Control and the L-Trac offers unparralled flexibility, performance and reliability. Designed to minimize the effects of contamination build up and the resultant degradation of performance, this high performance laser trackball uses highly polished stainless steel rollers. It has been found by CST that the "ruby ball sliders" used in most optical trackballs, cause performance degradation when "gunk" builds up on them. This can be annoying when playing games on-line (or anytime). The "mirror polished" stainless steel rollers do not readilly collect "gunk" and are easily cleared by spinning the ball rapidly. The Dupont Delrin bearings are embedded with teflon and internally coated with a lifetime lubricant making the feel of this trackball extremely smooth and it's reliability very robust. The stainless steel rollers are extremely tough and give a super smooth feel. Life testing indicates that this unit may outlive most users. It, most probably, will be the last pointing device you will ever need to buy. The shape of the L-Trac acts as a natural hand rest mirroring the natural contour of your hand. Designed to easily accommodate either right, or left handed users and different size hands. No need to move you arm to rotate your wrist from side to side. Flexibility, reliability and performance for every application. Switches: 3 high quality switches rated at 5 million actuations with over-travel protection. Low force stabilized switches.